It has been reported that Albert Pujols rejected an eight-year contract offer from the St. Louis Cardinals. There is some speculation that he is seeking a 10-year, $300 million deal that would keep him with the Cards until he is 40. But in Major League Baseball’s post-steroid era, is it such a good idea to pay a player so much, so late into his career? Just in the last couple of years we have seen Alex Rodriguez begin to regress and look like an overpaid player. And he is still just 34. So what can we expect from Pujols moving forward? Using Baseball-Reference.com’s “similarity scores,” we can put together a list of players with stats similar to Pujols up to their age-30 season. The list includes power hitters with good batting averages and most of the players are from the last 20 years. Players closely associated with Performance Enhancing Drugs were excluded (e.g. Barry Bonds, Sammy Sosa). 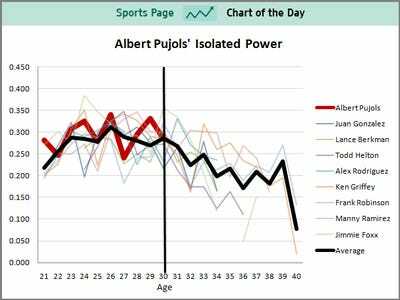 We can then compare these players to Pujols using Isolated Power (ISO, Slugging Percentage minus batting average), which gives us a measure of how much power a player has. We can see below that Pujols (red) compares favourably to the average of the other eight players (black) with the group reaching high levels of power at a young age and sustaining that though age 30. But that is where things started to go downhill for the other players. If Pujols does continue to mimic this group, his power will start to drop in the next year or two. Pujols does bring more to the table than just doubles and home runs. He is a career .331 hitter with a huge .426 career OBP. Both of those are tops among all active players. He is also typically an excellent defensive first baseman. But if Pujols does lose his power, his production value at the plate will diminish greatly, and all of the sudden a $30 million per year salary won’t look so good.